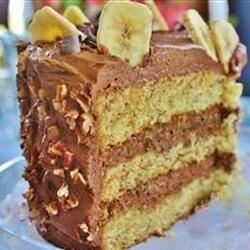 "This old-fashioned banana cake recipe uses buttermilk for extra complexity in flavor." Great Banana flavor, but I am looking for a more cake-like, fluffy texture, this was more like banana bread. Excellent! Great flavor and texture! Heavenly banana flavor! Frosted this delicious treat with a cream cheese icing into which I blended a mashed banana,and a bit of vanilla. Even better the day after. Moist and flavorful! Great cake, Syd. No problems with this recipe. I frosted the cake with the whipped cream frosting from this site. YUMMY!